Update: The new top navigation is now live. Please continue to post feature requests and bug reports as new posts and tag top-bar. We’ve opened up the new Top Nav to our power users for testing and feedback. Big thanks for all the participation, bug reports, feature requests, and usability insights. It was super helpful for us to uncover things we missed. As we continue working through bugs & tweaks, we want to keep you updated on our progress. We’re aiming to resolve all critical bugs before launch. Some changes will require more research and testing, which we’ll treat as incremental improvements post-launch. Please continue to post any new bugs/issues you come across by tagging top-bar. Also, keep an eye out for a blog post, explaining in much more detail, about how and why we decided to update the navigation. The review icon is problematic. It has a notification number which can never be dismissed. This is painful to constantly see. It is so distracting that I removed the entire icon with a userscript. It is a link in a group of dropdowns. This makes it likely to waste time from users aiming at the dropdowns. As an icon which represents only one link, it wastes important space, which could be used by other tools. The thin colored border along the top is suggestive of a loading bar and feels out of place to me. I think it would look better left out. It's much too tall in my opinion. Not enough contrast. Maybe it would bother me less with the dark scheme, but the not-so-dark gray of some of the content vs the light gray is not enough. Or the grayish orange (of the bronze badges). The "Questions" section is highlighted - as I write this reply - with an underline, even though I'm not looking at a list of questions (actually, this underline is generally annoying when there isn't some open pane directly under it). The dark colorscheme from before is much more to my liking. End result: It's distracting and makes me kind of edgy. Please consider reverting it. Access to Help - this is currently available in the nav for anonymous & low rep users. We’re not sure it’s necessary as a persistent nav item, but we are thinking about it. As a moderator, I use the help menu often when assessing requests to migrate something to another site. It's good to have a reasonably fast way to get to /help/on-topic without typing it out manually. I see two flaws that should be addressed. This is somewhat of an addendum to Travis' answer. Please change the review icon. Right now it is a speech bubble with what looks like a writing utensil either on a flat surface or next to an eraser. A speech bubble is almost universally used on the internet for chat messages, but we have a 3D physical desk-top inbox for letters as our notifications/messages icon (there's already an answer addressing that). Now that I know it's the review icon, I know what you're going for, but there are a ton of better (read: more obvious) icons out there to draw inspiration from that connote "review" more clearly than a speech bubble with a pencil. Even changing the speech bubble background to a document icon would be a big improvement. I think we should to inverse our brain so we can adapted with this new top bar, the right content are now in the left, why you changed the order, i think it was good? For those of us who use the site switcher (i.e. the hamburger) a lot, it's now a lot harder to do that (as it's way up on the right). More eye and mouse travel, and once you click on it more travel again (as it's left aligned, and for some reason I at least can't convince myself to click on the reputation number even though it is obvious it's the right row!). Any chance we could get keyboard shortcuts to make it easier to switch to the sites on our top 5 list? Something like W,1-5 would work, for example, or add to the G the 1-5 options. Honestly, my first reaction was: "Oh, you hopped on the new trend of fixed "menu" bars consuming vertical screen space? Grrreat..."
And the first thing I wondered was: "How do I get this bar out of the way"? Thanks for providing an option to let the top bar scroll up! It's called "Disable fixed site navigation". You have to be logged in for this to work, it's an option in your profile (click your avatar icon). Then go to the Settings tab, look for the Navigation group > Disable fixed site navigation. Details here. I would really like this option to be available when I'm not logged in, though. Reading the explanation on the blog, it would appear the navigation was changed to please users who come from Google and immediately scroll down. Reasoning was quoted from users who "do not notice anything above question title". While I understand how removing things above the question title may have pleased such users coming from Google, what I don't understand is why said pleasing had to be at the expense of the users who use this website regularly. 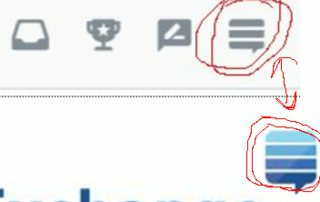 I do care about what I do here, I often revisit questions I recently answered (because on many many occasions people fail to use @notifications properly), and in doing so my inbox and my rep changes icon are my main tools, along with the "all actions" tab in my profile. Now that they are on the right, they are much less noticeable and go not only against the muscle memory but also against the natural habit of looking in the top left corner (1, 2). My most used tools are now in the zone of the least attention. The prominent StackExchange dropdown is reduced to an icon that does not immediately tell you what it does, so Meta is now less discoverable. The lack of the Help link is another inconvenience for experienced users who are willing to educate people by pointing them to certain help pages, as Help pages are now less discoverable too. The logo before "Questions" which links to the home page does not look to be a link just like the others ("Questions", "Jobs" etc), it looks like an icon for "Questions", and because of that I have clicked "Jobs" several times already, simply because I know there must be two "question" links (https://stackoverflow.com/ and https://stackoverflow.com/questions), but my mind fails to treat the logo as a separate link, and so I end up clicking the second word in the list which is Jobs. I will probably train myself to not do it eventually, but it's another example of lesser discoverability and added confusion, in my opinion. I understand it will not be reverted, so I had to start a stylesheet that udoes most of the unwanted changes. Very much disappointed about having to do that. On the blog you are reasoning that only 1% percent use the navbar; that may very well be true, but something tells me that the 1% of users that use the tools contributes much more than 1% of overall goodness to SO. The bar is too big on smaller resolution screen (1366x768). Please either fold it when scrolling up/down (and unfold it when hovered) or make it smaller. I think the old green of reputation is better than the new one, i suggest to change it to the old color. I often have SO open in a 'split screen' arrangement, where I snap the window to occupy half the screen, or at times even less. When the window occupies half the screen, the nav is obscured by the scrollbar, and the search is almost uselessly narrow. When I try to make the window even narrower, the nav remains fixed (you can't horizontal scroll the nav) and there is no way of accessing the far right buttons, except for resizing the window. I'm not knowledgeable enough to fix this, but I know this is something that need attention. My first thought would be a narrower logo (perhaps just the stack image) to free up some space. If it's possible, please at least move the site switcher/hamburger on other sites to the right, if you're going to keep this one there? It is very confusing to my muscle memory to go left on some sites and right on others. Using IE on a 1024x768 screen probably puts me in a tiny minority, but still, I was wondering whether this is by design? Height on this thing is freaking silly. Also I can't see icons behind notification counters. This is a common problem with most websites that have a sticky navigation bar as a header: page-up and page-down no longer work properly. (Of course they still work fine if the sticky nav-bar is disabled). Here are images to explain the situation. The first page displays the bulleted list all the way to "Added keyboard shortcut to Help". And then when you hit page-down, you see the next page of bulleted items. The page-up and page-down keys need to be modified so that the scroll takes the height of the stick navigation bar into account. Sorry for all the full-page images, but this is a full-page issue. I suggest to make the logo (and the link around it) fill up all space to the left of the screen - I use it quite frequently to get to the home page, and it is hard to hit in the current state. Especially on Stack Overflow, since the logo is so small. Shouldn't the site-switcher button have 2 lines in the middle, just like the original stack exchange logo? I'm not asking for changing it, but was just wondering if it's only because 3 lines fits better with other logos in the bar. Remove "Tags" and "Users", which I certainly use less often than the Help Center. Remove "Questions", too, because ... why would I click that instead of the homepage again? It could at least be shrunk down to "Q&A". 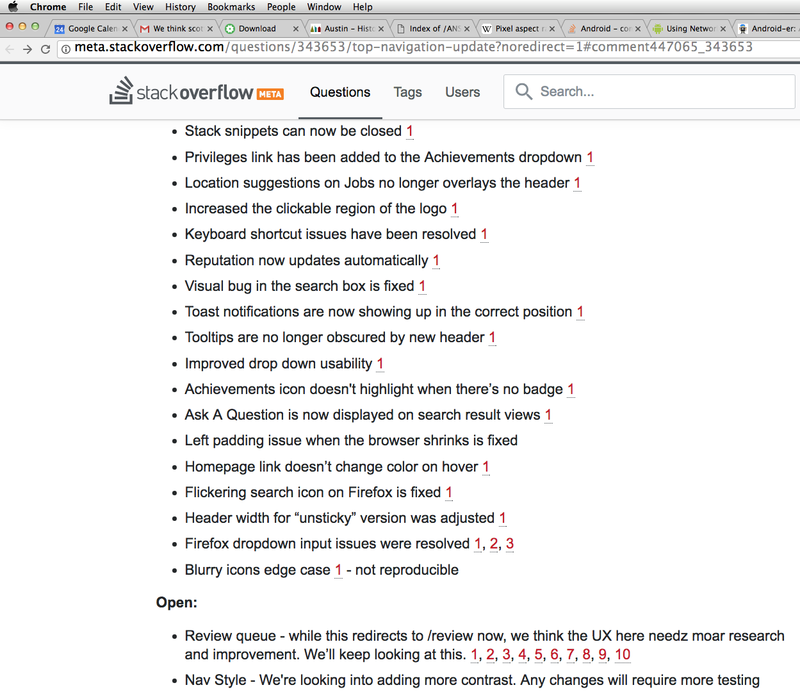 ... an "account" link to http://stackoverflow.com/users/edit/<uid> under the hamburger (in a position like "badges" in the achievements dropdown), since every other site on the web has such account settings on the far right. ... the glitter near the top of the achievements dropdown if it's really important that it be kept. That is, the only links and widgets I want are: Home, Notifications, Profile link, Search bar, Hamburger, Account Settings. I can tolerate Docs and Jobs, but would appreciate reduction in clutter where possible. What's driving my clutter hate? And similarly on the main site (albeit with Docs and Jobs). Yes, I'm no designer, and my paint skills rise scarcely above a freehand circle. Anyway, I generally like the changes and how responsive y'all have been to feedback. Edit: I care about this a bit less now that I know the site's keyboard shortcuts. Since I can press "S" to get to the search bar, it's less important that I can find it above by muscle mouse memory. I learned the shortcuts because the Help Center (removed from the top bar) can be reached with them. A "To Top" button would be nice as an addition in the header (IMHO). Sidenote: My answer may be off-topic, so let me know if I should delete this and post it in meta as a feature request instead. Or just like on http://php.net does, having an arrow show up on the bottom right soon as we start scrolling. There is room for it, unless they're reserving that space for something else. Problems: Lots of vertical space consumed. Low contrast. Unclear what opens up a pop-down, and what navigates away from the page, without clicking and seeing what it does. Tool tips missing on half of the options (everything Search and left). I just scanned through the question, the answers, and the blogpost, and didn't find any mentioning of this. Forgive me if I missed this. Why did you decide to omit the site name ("Stack Overflow")? It is here on meta, but not on the main site (neither on question pages nor the front page). Do you think your logo is readable enough so the text is not needed? I think the search input should be fix it is really hard to move to the left every time you want to search something, so fix it can be better and easy. Consider you already tip something [java] and hit enter now, try to change java to something else! now you should to move the cursor to the left so you can edit it, did you find this practice? for me i think it is a pert of time to move every time to the left for that i suggest to make it fix for example like the previous version https://meta.stackexchange.com/ , plus i don't find any necessity to make it resized every time, i'm wrong? 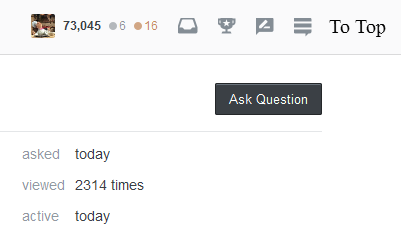 I'd prefer the Questions tab going away and it's space being taken up by increasing the size of the logo. 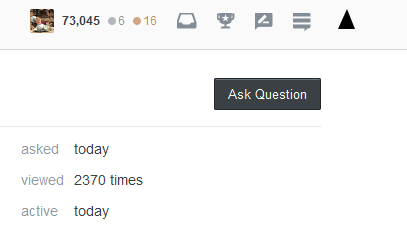 The questions tab as it is is redundant because you can get the same list of "newest" questions by clicking the logo and then the newest tab, and I find the list of questions that you get when you click the logo to be far more relevant/useful when looking for interesting questions. As far as the other three tabs, I don't see much of a reason to have "Users" front and center, SO isn't a social network and doesn't revolve around individual users, so this tab is mostly useless in my opinion. Tags I can see as being somewhat useful for getting stats and information on tags. I'd rather Documentation not take up so much space in the Nav. It's underregulated at the moment with the 100 rep bar for reviews with no tag based restriction, and not enough emphasis on stopping plagiarism. It's just in a state right now where I don't think we should be pushing more people to it until we actually know what it is supposed to be. Not the answer you're looking for? Browse other questions tagged discussion top-bar . How to go back to the old top bar? Is the top bar redesign the sole cause of the suggested edit slowdown? Has the top bar redesign met its goals? Is the new Top Bar going to be rolled out to all SE sites in the future? Where did the Review Icon go? 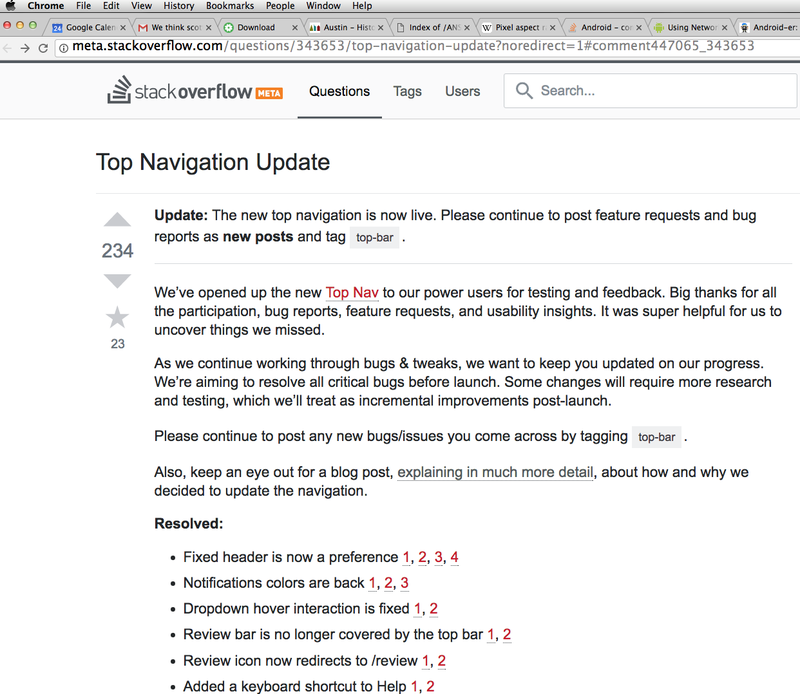 Phase Two of Top Navigation Testing Begins Soon!